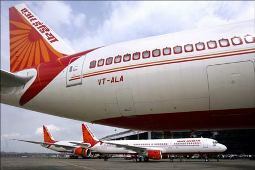 Not providing accommodation to an elderly couple after their Air India flight to Delhi from London was repeatedly postponed has resulted in the national carrier being directed by a consumer forum here to fork out Rs 80,000 as compensation to them. The New Delhi District Consumer Disputes Redressal Forum observed that the couple was left to fend for themselves and had to incur additional expenses in their extended stay in London and in travelling to and fro from the airport. "We hold opposite party (Air India) guilty of deficiency in not providing the old couple sufficient accommodation when their flight was repeatedly postponed and leaving them alone to fend for themselves. "This has caused mental agony and harassment to the old couple and they are entitled to compensation by opposite party for all the expenses and mental harassment suffered including litigation. "We allow the expenses of Rs 55,000 (claimed by the couple),"
a bench presided by C K Chaturvedi said. The forum also granted compensation of Rs 25,000 to the Delhi-based couple, Ashok Bajaj and Bimla Rani. The order came on the complaint filed by the couple who had alleged that they found out about the cancellation of their flight scheduled for December 18, 2010 after reaching Heathrow Airport, UK as the airline did not inform them in advance about the same. After telling them that their flight would leave the next day, December 19, 2010, they were later informed that it would leave on December 21, 2010, the couple alleged, adding that as a result they had to incur additional expenses of Rs 55,000 on hotel accommodation, food and taxi fare. They also alleged that the airline did not make any arrangements for their stay at the airport, despite their requests. The ex-parte order was passed against Air India as no one appeared on its behalf initially and no reply was filed by the airline before the verdict was reserved.